In the course of this study, we have come across various pieces of information which add together to indicate the possibility of a comet, asteroid or planetoid with Sirius connections passing uncomfortably close to the Earth around 2012, or 2013. Let me just run through these snippets again. 1. The Tarot; We found the tarot to be directly associated with the Apocalypse, or Revelation of St. John; and Atu 17, the Star, to be related to Sirius by Court De Gebelin and Grant). 2. The Book of Revelation; Trumpets 2, 3, and 5 announce phenomena that would accompany the close by-pass of a large satellite or planetoid; earthquakes, floods, meteorite showers, dust blocking sunlight and moonlight, large meteors, thunder and lightning, etc. 3. Mummies and the Rapture; We found Egyptian connections in the Tarot, along with the Christian ones, and connections between the two religions, especially as regards resurrection and judgement, which feature strongly in the Tarot and Revelation. Anubis, Isis and Nephthys all feature in Egyptian judgement scenes, and are all connected with Sirius. 12. Quantum Leap: Hunt-Williamson, Hope, Grant, and Andahadna all think Sirius will be involved in an imminent quantum leap of consciousness, and they all agree on the existence of a transplutonic planet. 14. The Wormhole of Daath: Since I discovered that Nibiru would have to be traveling impossibly fast to cover the distance between Earth and Sirius (and back), in 3,600 years, I searched Grant’s material for clues. I found that Uranus is connected with Daath - the eleventh, or secret sephira of the tree of life, which leads to "the paths beneath the tree" and is "the gate to the other universe". Yog-Sothoth (connected to Uranus) is "the gate through the Aeons to the star-source beyond Yuggoth" (Yuggoth = Pluto). Marduk, a Babylonian god associated by Sitchin with Nibiru, is implicated in the form of Megor- Marduk, "the last gate", who resides at the pylons of the abyss. I suggested the possibility that the planet known as Nibiru, Marduk, Persephone, Patras, and Isis, may have originated in the Sirius system, and that it might travel from this system to Sirius and back through a space-time by-pass, or wormhole, which exists somewhere near Uranus, or between Uranus and Pluto. NB. 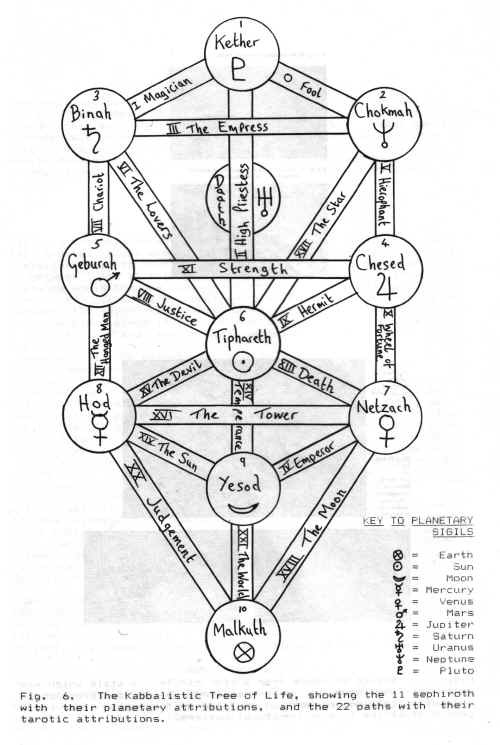 This diagram shows the Tree of Life accepted by Crowley-influenced groups such as the A.A. and O.T.O., since the positions of the Emperor and the Star have been reversed, as suggested in Crowley's Liber Al vel Legis. For standard interpretations, e.g. in Monument to the End of Time, (see Whats New item 21), the Star connects Yesod to Netzach, (& the Emperor: Tiphareth to Chokmah). Incredibly enough, I have found a stack of evidence that seems to support this bizarre idea. Most of it is taken from the epic work on mythology by De Santillana and Von Dechend, called "Hamlet’s Mill". The theme of the book10 is that myth is essentially cosmological; that the ancients passed on complex cosmological information in the form of stories about the gods and ancestors. One of the recurring themes is a knowledge of the Precession of the Equinoxes. Shakespeare’s Hamlet was based on Scandinavian mythology about Amlodhi, (or Frodhi), who was the owner of a mill. When an enemy killed Hamlet and stole the mill, he put it on a ship, the mill broke, and the ship sank, causing a permanent whirlpool. After comparison with other mythology, the authors concluded that this is a remnant of the story of the cosmic collision that caused the tilt in the Earth s axis. (the obliquity of the ecliptic), which gives rise to our seasons and also the 26,000 year cycle of precession. The massive interweave of evidence is very convincing, even down to the names some cultures still use for the polar stars e.g. Mill-peg and The hole of the Mill peg). However, this may only be part of the story, as further mythological comparison reveals. of Mankind, but stole fire and gave it to humans. Zeus punished Prometheus by chaining him up to a mountain, so an eagle ate at his liver for several generations. This parallels the creation story from the bible, where Adam (which means "Man") was given fruit of the tree of knowledge by a snake representing Satan. God punished the snake by taking its legs away. In the Indonesian Rama epic, when Rama is about to shoot his magic arrow into the sea, a lady arises from the sea to warn him that "right here was a hole in the ocean leading to the underworld, and who informs him that the water in that hole was called the Water of Life. "24 This parallels the story from Northwest America, of the maiden who shoots her arrow into the "navel of the waters which was a vast whirlpool", thus winning fire. An old Iranian story tells how the star Tishtriya soars like an arrow to Lake Vurukasha, causing the centre to surge up and flood. Tishtriya is the name for Sirius, which shares another name - Tira - with Mercury, who was Hermes, the messenger of the gods to the Greeks, and the father of Pan. The Babylonian name for Sirius was KAK. SI. Dl., which means "arrow", and the Sumerians, Babylonians, Egyptians, and Chinese all had a constellation built from stars of Argo and Canis Major, which resembled a bow and arrow, in which Sirius was variously either the tip of the arrow or the target. Sitchin has equated the Babylonian god Anu with the planet Uranus. It is interesting, then, that Marduk is said to have entered the "Way of Anu", and that the god Marduk claimed the "Anu-ship" for himself. If the Way of Anu is the orbital plane of Uranus, rather than "a band, accompanying the equator" as claimed by some experts, maybe the "stargate" is located in that plane. Alternatively, the Way of Anu could be a name for the celestial passageway itself, situated in the vicinity of Uranus. The Sumerian name for the constellation marking the gateway to "Paradise" was l-Iku. which is the Pegasus-square. It lies between the two fish of the Pisces constellation. This word. Iku, was a fundamental field measure, and was taken by Unqnad (1923) 29 to represent Paradise as the primordial field. This is reminiscent of the Elysian fields of the Greeks, which were near the Underworld, though not part of Hades’ dominion (near Pluto, but not in its orbital plane?) Moreover, an iku is about 3,600 square metres, and 3,600 is the orbital period claimed by Sitchin for Nibiru. 1-Iku was also the name of the Temple of MARDUK in Babylon. The ark of Utnapishtim was a cube of floor-space one iku, and "since the ark disappeared there was a stone in its place... which was called foundation stone". This foundation stone covered the abyss, or Apsu; (remember that Daath lies "in the midst of the abyss"). Could this "stone" be Uranus? We are told that "l-Iku, the Pegasus-square is called the "habitation of the deity Ea, the leader of the stars of Anu"", and that "Marduk lies with his feet within Ea". Since Sitchin says that Ea represents Neptune,30 if Marduk’s feet are in Neptune, is his head in Uranus? (ugh!) If the meaning of all this is, that when a line is projected from Earth to Pegasus, at a point between the orbital planes of Neptune and Uranus, will be found the whirlpool, then it doesn’t quite work, as the ecliptic, or path which the planets take across the sky passes between the two fish of Pisces, but BELOW Pegasus. So, either the whirlpool is not actually IN Pegasus, but near it, between the fish, at a point between the orbital planes of Uranus and Neptune; OR the whirlpool IS at a point along the projected line to Pegasus, but at a distance from the Earth between the distances of Uranus and Neptune.